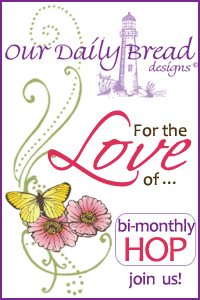 Welcome to the Our Daily Bread Designs Alumni Team bi-monthly hop, this weeks hop theme is For the Love of ODBD Best Sellers! If you arrived here from Chris Olsen's Blog you are in the right place, if not you might want to head back to the ODBD Blog and hop from the beginning. You'll want to be sure to visit and comment on all the participating designers blogs, because one of them is a hop hot spot and a name will be drawn from that blogs comments to win a $15 ODBD gift certificate. You have until Wednesday, January 2nd at 6PM EST to leave comments. Before I share my project for the hop, I wanted to let you know that Our Daily Bread Designs is offering FREE SHIPPING on all US orders through Saturday, December 22, 2012 midnight EST. International orders will receive $5.00 off the regular shipping charge! For more details see this blog post. The focal image on my projects is one of ODBD's Best Selling sets called Christmas Tree Collage. I also used Sparkling Snowflakes and the Snowflake Mini Set from the December Release. To create my projects, I stamped the Christmas Tree Collage in Chocolate Ink on Vanilla card stock, and colored the tree with STAEDTLER Karat Aquarell WC Pencils, blending with Gamsol, and the ornaments with Mars Graphic Watercolor Markers. The stamped panel was sponged with Chocolate ink. 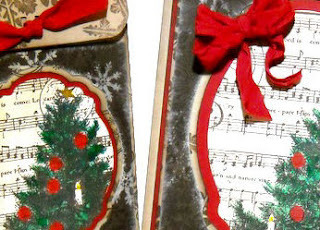 The cut frame pieces were stamped in Chocolate and Malted Paint using images from the Snowflake and Snowflake Mini Set. Both the frame pieces and bag were cut using the Silhouette Cameo and Gift Bag cut file. To embellish I added some Basque Red Vintage Seam Binding. The Seam Binding on the card was tied into a double bow using Becca's Peg Bow Maker. Thanks so much for stopping by, your next stop is Michelle Laycock's Blog. What gorgeous projects Lisa!! I just love that Christmas stamp and you used it beautifully. Love it in the oval!! Once again some wonder art! What a good idea to decorate the little gift bag! Very pretty projects! Wow Lisa!! What an awesome way to show case this tree collage...Beautifully done!! Great card and gift bag duet! Love this pretty stamp! Beautiful projects Lisa! Love the red frame and stunning backgrounds! Merry Christmas! The 2 sets go together so well, luv what you did, the bag is something I need to make for a gift. Love your projects, the stamps you used are perfect together! Gorgeous trees on your beautiful card! Thanks for sharing! Such pretty projects! That tree stamp is gorgeous! I always like to see how others will use this set. It is one of my favorites. Your little treat bag and matching card make a wonderful gift indeed. This is one of my favorite stamps. I love what you did with this card. Good job. Wonderful creations with this stamp! I really like this image and love how you have used it in yet another way! The die cut and red shadowing set it off so nicely! very pretty!! I like that it is a set with a gift bag! One of my favorite stamps and your card is beautiful. oh I really like this gorgeous card and gift bag! Love the background paper you created with the snowflakes. Absolutely gorgeous!! Lovely matching set, I like how you only used a portion of the stamp!! Fabulous card, Lisa...i love your creations and look forward to see more of them here! Thanks for sharing your talent. Beautiful card exuding the warmth of the season. Beautiful set Lisa - who wouldn't love to receive this at Christmas time??!! Gorgeous! Love the gift bag and the coordinating card. Sweet colors and design! Wow, what a gorgeous set!!! I love the cool gift bag and the snowflake background looks amazing! HUGS!!! So beautiful Lisa...I love the *POPS* of red throughout...so lovely! Lisa, these are awesome! You are going to wear that stamp out!! Beautiful projects...I can see why that tree collage is a best seller! Very pretty! Love the red "frame" around the focal image. Really draws your eye right in. What a wonderful gift bag and matching card, Lisa! Love the way you framed this beautiful image! Lisa, this is such a great gift idea! Beautiful gift set! Love the colors and the background stamping! I so want those snowflakes! The last release was great. Thanks for sharing your creations! Such a gorgeous card and gift bag! That is one of my fav stamps and you've designed it so beautifully! Your gift bag and card are both so lovely. TFS. God bless! What beautiful card and gift bag set! Gorgeous coloring! Stunning work Lisa~have a blessed New Year!